1. The Flush Fit Register Booster™ will be as warm as the air that is delivered from the register of your forced air furnace and/or cooling system. The maximum temperature for the register is 140° Fahrenheit or 60° Centigrade. Your Flush Fit Register Booster™ should never be exposed to higher temperatures or temperatures below freezing. 2. Do not in any way block the air grilles of the Flush Fit Register Booster™. Pressure on the bottom or top grilles of the Flush Fit Register Booster™ may cause the fan impeller to contact these grilles and damage the unit. 3. Unplug the Flush Fit Register Booster™ when not in use. Turn the unit off before unplugging. 4. Do not operate the Flush Fit Register Booster™ with a damaged plug or cord, if the unit malfunctions, becomes noisy when operating, has been dropped or otherwise damaged, or if the housing is damaged or broken. Discard or return the unit for inspection, replacement, or repair. 5. Do not run cord under carpeting. Do not cover cord with throw rugs, runners, or similar coverings. Do not route cord under furniture or appliances. Arrange cord away from traffic area and where it will not be tripped over. 7. The Flush Fit Register Booster™ is designed for indoor use only. 8. Never insert any object or allow any object to enter the Flush Fit Register Booster™ through the bottom or top grilles, as this may damage the unit or cause it to malfunction. 9. Do not use the Flush Fit Register Booster™ near flammables such as gasoline, paint, or natural gas. 10. 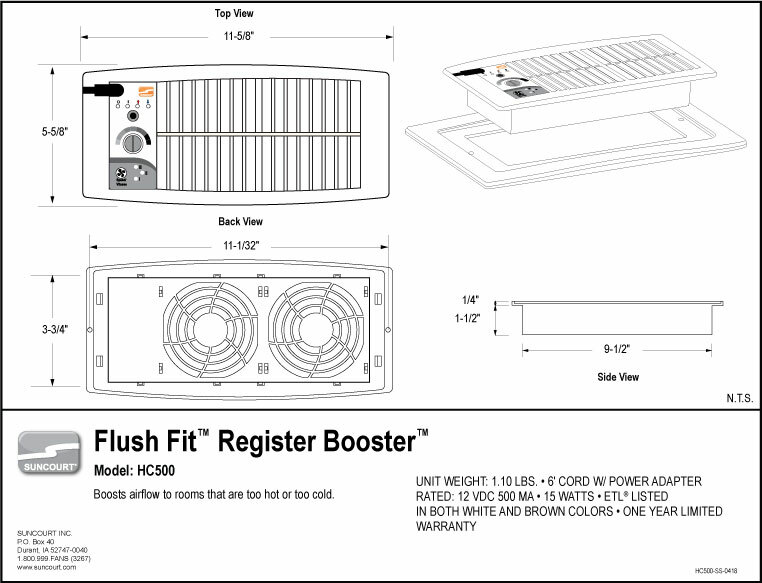 The Flush Fit Register Booster™ is intended for use as described in the instructions only. Other use may cause fire, electrical shock, damage to the unit, or injury to persons and will void any warranty by the manufacturer. 11. Do not use strong detergents or flammable liquids to clean the Flush Fit Register Booster™. 12. The housing of your Flush Fit Register Booster™ is sealed at the factory. THERE ARE NO SERVICEABLE PARTS INSIDE. Attempting to open the housing will expose you to dangerous electricity, may cause fire and will void any and all warranty. DO NOT INSTALL IN CEILING. 2. Secure the Flush Fit Register Booster™ in place. Before cleaning the Flush Fit Register Booster™ disconnect the power cord from the outlet. Dust may be removed from the exterior surfaces using a soft cloth, the round brush attachment of your vacuum cleaner, or a cloth that has been lightly moistened with water and a mild, non-abrasive detergent. Dust accumulation in the interior of the unit may be removed by using the small round brush attachment of your vacuum cleaner. Accumulation of dust in the interior will be minimized by regular replacement of your furnace filter as recommended by the manufacturer. Subject to the following limitations, Suncourt Inc. (manufacturer) warrants that the Flush Fit Register Booster™ will, for 1 (one) year from date of original retail purchase, but not exceeding 2 (two) years from date of manufacture, remain free from appearance of defects in workmanship or materials. This warranty is subject to the following limitations: (a) manufacturer’s liability is limited to the replacement or repair of the unit, as decided by the manufacturer; (b) a defective unit must be returned, prepaid, with proof of purchase, well packaged to avoid damage in transit; and (c) this warranty does not apply to defects resulting from the alteration, abuse, accidental damage, unauthorized repair, or misuse of the unit. This warranty is given in lieu of all other warranties, guarantees, and conditions on manufacturer’s part, and the manufacturer shall have no tortious or other liability in respect to this Flush Fit Register Booster™. Ship unit to Suncourt Inc. only after obtaining a Return Goods Authorization (RGA) number. Returns without this RGA number will not be accepted. Actual product appearance may differ from illustrations. Suncourt reserves the right to modify any or all of its products' features, designs, components and specifications without notice. When the HEAT (↑) light is on, the Flush Fit Register Booster™ will turn on as temperature rises. Allow your unpacked unit to acclimate to room temperature for several hours before applying power or making initial settings. 1. Start the operation settings with the Flush Fit Register Booster™ in the register and when the forced air system is not running. 2. Remove the register and insert the Flush Fit Register Booster™ in the opening. Insert the small end of the power supply cord into the receptacle on the Flush Fit Register Booster™. Plug the power supply into your 110V outlet. Additional length can be added to the power supply cord using a 2.1mm ID / 5.5mm OD low-voltage extension cord. 3. Press the mode button until the OFF light is lit. The OFF light will dim 4 seconds after this mode selection is confirmed. 4. Turn the rotary setpoint knob clockwise until it stops. DO NOT FORCE. 5. Press the mode button twice. The red HEAT (↑) light will be lit and the fans will not be operating. 6. Wait for your furnace to start. Allow 60 seconds of furnace blower operation before proceeding to next step. 7. Slowly turn the rotary setpoint knob counterclockwise until the fans turn on. Move the dial across one "square" each 4 to 5 seconds. 8. The Flush Fit Register Booster™ is now set to turn on when the warm air from the furnace reaches the register boot. 9. Allow the furnace cycle to end and observe that the fans turn off. If your furnace has a 'purge' cycle (60 seconds of blower operation after heat has stopped), the fans should stop toward the end of the purge cycle or several seconds later. If your furnace does not have a purge cycle, the fans will continue operating after the blower has ended until the air in the ductwork is no longer warm. 10. Observe the next furnace cycle and make note of when the Flush Fit Register Booster™ fans turn on. b. If the fans never turn on at all during the furnace cycle, move the dial slightly more clockwise to choose a higher temperature setpoint. The Flush Fit Register Booster™ must detect a temperature drop in between furnace cycles that is several degrees below the setpoint. A setpoint that is too low (too close to room temperature) will not allow the unit to operate. You will not observe the effect of this adjustment until the next furnace cycle. When the COOL (↓) light is on, the Flush Fit Register Booster™ will turn on as temperature drops. 4. Turn the rotary setpoint knob counterclockwise until it stops. DO NOT FORCE. 5. Press the mode button three times. 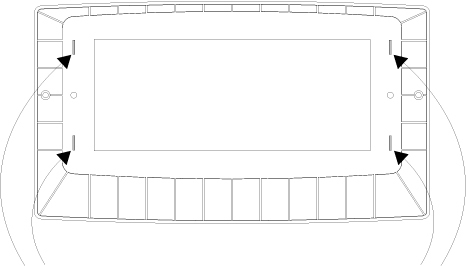 The blue COOL (↓) light will be lit and the fans will not be operating. 6. Wait for your air conditioning to start. Allow 60 seconds of central blower operation before proceeding to next step. 7. Slowly turn the rotary setpoint knob clockwise until the fans turn on. Move the dial across one "square" each 4 to 5 seconds. 8. The Flush Fit Register Booster™ is now set to turn on when the cool air from the A/C reaches the register boot. 9. Allow the A/C cycle to end and observe that the fans turn off. If your central blower has a 'purge' cycle (60 seconds of blower operation after cooling has stopped), the fans should stop toward the end of the purge cycle or several seconds later. If your central blower does not have a purge cycle, the fans will continue operating after the blower has ended until the air in the ductwork is no longer cool. 10. Observe the next A/C cycle and make note of when the Flush Fit Register Booster™ fans turn on. b. If the fans never turn on at all during the A/C cycle, move the dial slightly more counterclockwise to choose a lower temperature setpoint. The Flush Fit Register Booster™ must detect a temperature rise in between A/C cycles that is several degrees above the setpoint. A setpoint that is too high (too close to room temperature) will not allow the unit to operate. You will not observe the effect of this adjustment until the next furnace cycle. To reduce observable noise, select the lowest fan speed that adequately delivers the required air to the room. The Flush Fit Register Booster’s™ memory will retain all settings automatically (speed, function, and temperature set point). The HC500 has 3 speeds. What will the Flush Fit Register Booster do for me? The Flush Fit Register Booster is designed to be placed in your existing register. It will replace a standard 4" x 10" register grill and boost the airflow from that register. By boosting airflow, it will warm up rooms that are chronically cold in the winter and cool down rooms that are chronically too hot in the summer. Does the Flush Fit Register Booster heat or cool the air? No. The Flush Fit Register Booster neither heats nor cools the air. 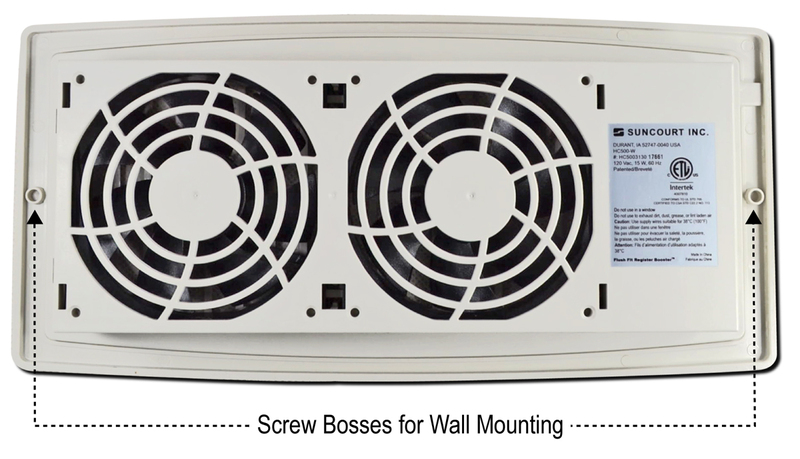 It boosts airflow from a register, thus bringing more heated air from your furnace or cooled air from your air conditioner into a problem room. The air coming from the Flush Fit Register Booster feels cold during the winter heating season. Moving air flowing over your skin feels colder than still air. The temperature of the air is in fact the same. That "cold" sensation on your skin comes from the evaporation of the moisture on your skin caused by moving air. That is why sitting in the airflow of a fan feels good on a hot summer day. The air from that fan has the same temperature as the other surrounding air. Again, the air movement over your skin causes the chilly sensation. That is why drafts are so uncomfortable. How do I connect the Flush Fit Register Booster to the power? No installation is required for the Flush Fit Register Booster. You simply place it in the floor register (4" x 10" maximum size) plug the small end of the transformer in the outlet on the face of the Flush Fit Register Booster then plug the wall transformer into the nearest 110 Volt wall outlet. How much electricity does an Flush Fit Register Booster use? The Flush Fit Register booster uses very little electricity. With the fans on high the booster uses about 15 watts of electricity. Can I mount the Flush Fit Register Booster on a wall register? Yes, small screw bosses are molded into the back of the Flush Fit Register Booster. Drill out the bosses with a 3/16" drill bit and secure the HC500 to the wall. Directions are also provided on our instruction page. How do I turn the Flush Fit Register Booster OFF and ON? The Mode button will cycle through the four settings for the Flush Fit Register Booster. When the mode button is pressed and the "ON" light is lit the automatic thermostat function is bypassed and the fans will remain on. If you want to circulate a small amount of air this is the mode to use. Your Flush Fit Register Booster is equipped with a highly sensitive electronic thermostat. 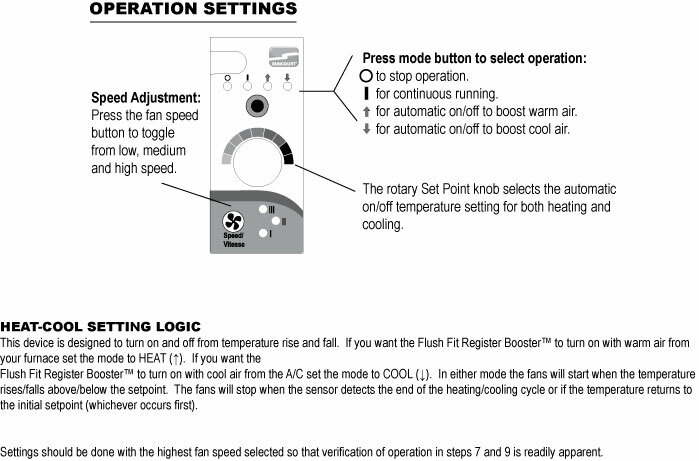 When the Mode is in the "HEAT" or "COOL" setting the thermostat will control the on/off of the fans. In the "HEAT" Mode the thermostat will automatically turn the fans on when it senses heated air after the furnace starts. Similarly, when in the "COOL" Mode it will turn the fans on when it senses cooled air after your air conditioner starts. This operation is fully automatic and you have a control on the function panel to fine tune when you wish the Flush Fit Register Booster to start and stop. Can I run my Flush Fit Register Booster continuously? Yes. When the mode button is pressed and the "ON" light is lit the automatic thermostat function is bypassed and the fans will remain on. Why do the instructions say, "unplug when not in use?" We recommend that you unplug the Flush Fit Register Booster between seasons when neither the furnace nor air conditioner is operating, during vacations when you are away from home, etc. This will save wear and tear and unnecessary energy use. Can I mount the Flush Fit Register Booster over a ceiling register? Suncourt recommends against mounting an Flush Fit Register Booster over a ceiling register for safety concerns in the event the unit would fall down if not properly attached. Can I use the Flush Fit Register Booster upside down? The Flush Fit Register Booster will operate in any position. Can I use the Flush Fit Register Booster to vent outside air? No. The Flush Fit Register Booster is not approved to vent outside air (such as in a window) where the unit may become wet from rain or excessive moisture. Is the Flush Fit Register Booster safe? The Flush Fit Register Booster has been rigorously tested to the Standards of Underwriters Laboratories Inc. (UL®) for your safety. The housing is made of a high impact flame retardant ABS. How do I clean my Flush Fit Register Booster? Generally, maintaining a clean household and regularly replacing the central air system filter will avoid build-up of dirt and dust in the Flush Fit Register Booster. The Flush Fit Register Booster cannot be opened for cleaning. Doing so would void the warranty and poses a risk of injury. Normally, accumulated dust can be blown out of the unit and dirt can be removed using a small brush or cotton swabs.